Heise Hot Springs has a natural mineral hot spring kept at a temperature of about 104 degrees Fahrenheit. It is perfect for soaking those sore muscles and joints, sitting and relaxing, or just warming up from the cold during the winter! We also have a warm pool, which is fresh water and kept at about 92 degrees. Its temperature and shallow depths make this pool ideal for little kids and families. 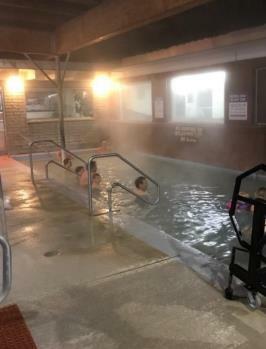 Winter Hours: Hot Pools are open Labor Day until the Thursday before Memorial Weekend, and closed through the month of November. 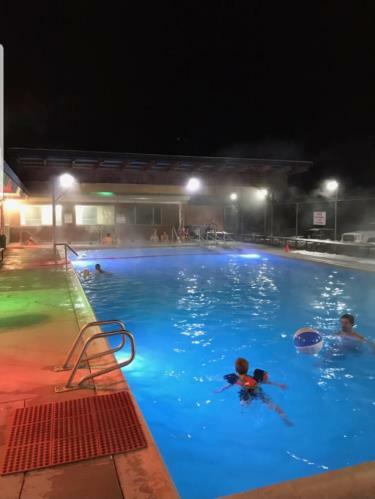 Monday - Friday: 2:00 p.m. to 10:00 p.m.
Saturday & Sunday: 10:00 a.m. to 10:00 p.m.
Summer Hours: The Hot Pools are open Friday before Memorial Day thru Labor Day. Monday - Sunday: 10:00 a.m. to 10:00 p.m.
Each person who enters the pool areas is required to purchase a pool pass. $5 will be returned upon exit of the facility if you did not swim. The water is slightly charged with hydrogen sulfide gas.